To identify a space is a challenging undertaking filled with problematic notions of graphing, naming and containing a territory. Yet to identify a memory or moment created within a space is a more plausible endeavor. One of the powers of physical space is its unyielding ability to create a temporary and temperamental place. But it is the inhabitants that give birth to the settlement itself. Cities, on the one hand, often make one feel small or insignificant, while on the other, they also make one feel enlarged and intoxicated by its growing space. 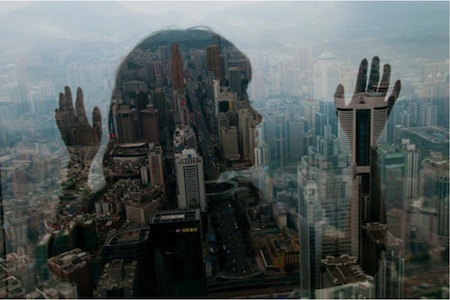 In this short paper, I will use China based photographer Jasper James’s photographs of cities through the silhouettes of people to explain how these images that combine cityscape, portraits, and one’s individual existence metamorphosis into one; how they become an invitation to see the world differently. With humble and distant observation, James’s “City Silhouettes” series is taken in Beijing, China, one of the most populated megalopolises in the world. The density and immense traffic of human encounters on the daily basis is here staggering. However, these images give the viewer a chance to have a singular moment with one person in the foreground while simultaneously seeing the habitat of over 20 million residents in the background. The silhouettes function as a portal between the mind and the moment (of seeing), the occupant and the occupancy, the organic person and the inorganic structure of linear city architecture, and so on. Using three superimposed layers to make the photographs, James emphasizes the person, the city, and the sky and in each image declares the illusion of chaotic solitude or the multiple nature of each individual. 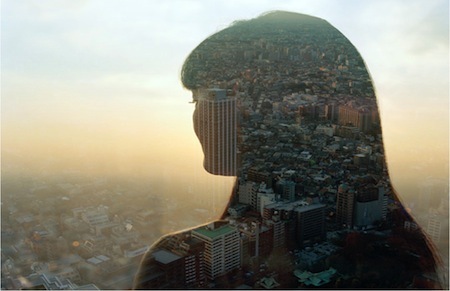 In Figure 1., we see a woman looking down upon the city with a nurturing and pensive yet determined tone. A major color spectrum can be identified: from the darkest black to the palest white. The lighting seems similar to the sky when reaching dawn and the fading of the layers causes the building structures to blend in displaying a hue of softness, a misunderstood lightness and overall vulnerability. Perhaps this is the woman’s perspective of the municipality, of her lived experience, and simultaneously her moment of genuine experience of the city. But the more general question that arises is this one: How does this images relate to any urban person’s lived experience? Simply put, we all see reality through our own eyes. The magnitude of any city can never camouflage the magnitude of the self. Moreover, the identification of each silhouette is vague enough to allow anyone with a vivid imagination to slip inside its shadows and fill in the void. James has concurrently revealed, first, how small we are as humans in a metropolis and, second, how big we are as individuals in a metropolis. He questions the viewer to decide for herself or himself which of the two unveilings to scale at that particular moment of seeing. In Figure 2. James’ image of the urban child is a muddled message to decipher, with conflicting tonalities between a lost child pleading for help and a curious child enamored with its concrete fortress. Is this surrender or praise? Is the city a welcoming haven for a child or brutal fast lane? This particular moment captured by the image suggests both polarities of experience. In addition, the sides of the image are blurred which in turn gives the outline of the child a highlighted contrast and sharpness. If this is the child’s perspective, is it steered within parameters? Are there limitations to what the child can see? Or else, what can the viewer see through the child? Is the child enchanted by the colossal constructions or just forgotten among monuments of business world? James’s use of contrast gives way to interpreting the shapes of emotion within the physical layouts, where the only way to go is up. The buildings rise as the child rises too, and the movement is not only captured but also suggested as limitless..
Each photograph thus has a variety of colors from the full spectrum allowing for layered and multiple interpretations to emerge. If the colors were pastel, the images would seem lighter in tone and expression; if the images were in monochrome, the messages would lack certain depth. The use of color and fading with the white to black spectrum gives them a realistic documentarian tone. The city then also becomes multi-layered space and a multiplicity in itself. Some people allow for a city to drive them: drive them mad, drive them to success, drive them away, while others remain as they were and become interiors of the city. James portrays the insight of the separate: the endless particles of the mass that form megalopolis. In a city like Beijing, with limited spacing capacities, the photographer has achieved a way to represent individualism using just light and angle. As a creative resistance to territorial assault, James manages to make the viewer briefly experience the dizzying inertia of a city; a moment in which a viewer, that is, human figure, can for a second exceed the scale of a megalopolis. I think that James’s photographs operate as superior ads for the city, providing a fresh image of Beijing, one where art perfectly folds into superior marketing.